Radio Rentals was formed in 1930 in Brighton, Sussex, UK with a turnover in the first year of £780. It later moved into televisions and ultimately video recorders. Growth of a public TV service after the war encouraged more people to want TV sets but they were expensive, leaving an opportunity for Radio Rentals to offer them out as an affordable monthly rental.Video recorders and a range of white goods came next as the business took off. The Radio Rentals story in Australia began with a single shopfront in Market Street, Sydney in 1937. Today, it is Australia’s leading household appliance, technology and furniture rental company with over 70 stores in Australia and nearly 30 stores in New Zealand and more than 500 employees.The parent company is Thorn Group Limited. 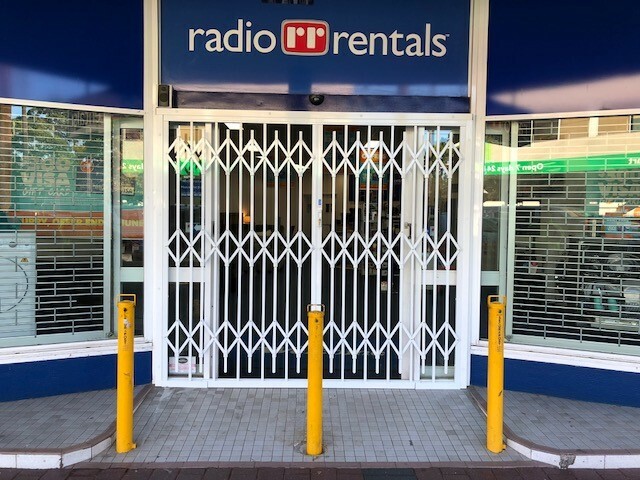 Radio Rentals quality range of high value products are a natural target for persons wishing to profit through theft by break and entering through the various storefront entries. 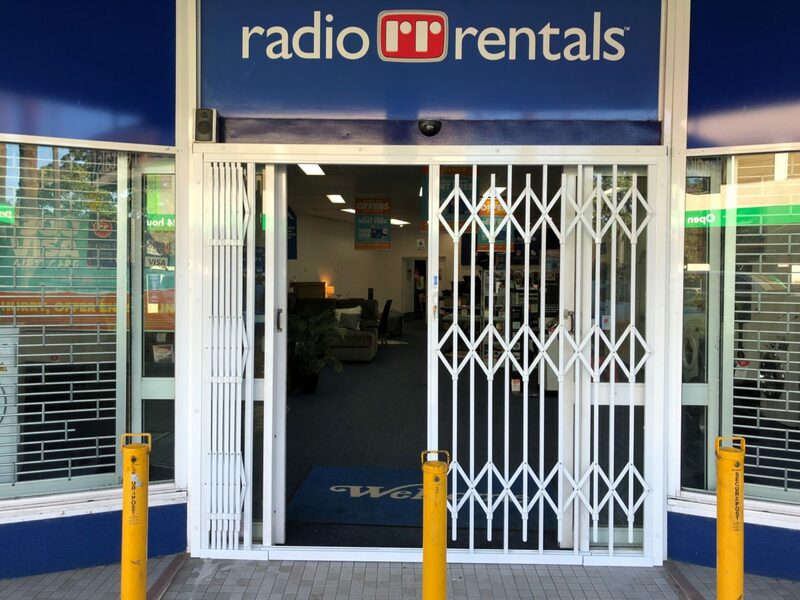 The Group have for many years turned to the high level of security provided by The Australian Trellis Door Company’s (ATDC) security doors to protect their stores and their merchandise.The above photograph shows a recent typical installation at the Group’s Penrith Store in Sydney’s outer western suburbs. Many of Australia’s leading retailers are installing ATDC’s shopfront security doors to protect their stores against break and enter as it is a relatively inexpensive yet effective deterrent and a favourite choice for both loss prevention managers and insurers alike. In addition these doors with their sharp jagged lines and angled metal parts have an eye catching edgy look and feel to them resulting in many customers selecting them when wishing to make a statement or merely keeping up with the latest in architectural trends.Certainly a standout and something different on offer to the often staid and more common appearance of traditional roller shutters and folding doors which have graced retail store design and appearance in this country for decades. For more information on ATDC’s comprehensive range of shopfront security doors for commercial and industrial applications visit ATDC’s website at www.trellisdoors.com.au/products/commercial-security or contact the company toll free from anywhere in the country on 1800657435.